"Samurai: An Illustrated History" brings the violent, tumultuous, and, at the same time, elegant world of the medieval Japanese samurai to life. 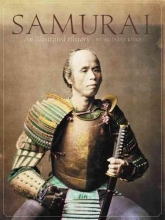 With a general introduction that examines the origins of the samurai and their rise to power, Samurai presents a chronological coverage of samurai history detailing the main battles, personnel, and general themes. Additional chapters are studies of samurai armor and weaponry, fortifications, and the changes in strategy and armor upon the introduction of firearms and cannon. All chapters are illustrated by photographs of battle re-enactments meticulously conducted by the enthusiastic historical re-enactment societies of Japan, and by line drawings of fortifications and armor. Samurai vividly details the long bloody era of the samurai, when sons killed their fathers, brothers attacked their brothers, wives betrayed their husbands and hosts their guests, and the forces of the samurai rulers destroyed those of the emperors and the monasteries. The samurai fought for property, lands, and money, and only rarely for honor--Samurai tells that compelling story with vigor.